All steam electric power plants in Maryland are located in the Chesapeake Bay watershed. Power plants are significant users of water in Maryland, and their operation can affect aquatic ecosystems as well as the availability of water for other users. This section describes the surface and ground water withdrawals, consumption and discharges in Maryland from power plant operations. It also describes potential resource impacts and methods for minimizing any adverse impacts. The effects of transmission lines on aquatic resources are discussed in Section 4.2.2. Other than a small segment of western Maryland and small estuarine water bodies of the Atlantic Shore, the bulk of Maryland's drainage system feeds the Chesapeake Bay. All of Maryland's primary rivers drain into the Chesapeake Bay: Potomac, Patuxent, Patapsco, Susquehanna, Chester, Choptank, Nanticoke, Blackwater, and Pocomoke Rivers. Together, these rivers and the Bay extend over a large geographic area and encompass a broad range of aquatic habitat types, including marine, estuarine, and freshwater rivers and lakes. Most electricity produced in Maryland is generated by one of four types of generating technologies: steam-driven turbines, combustion turbines, combined cycle facilities (a combination of steam and combustion turbine units), and hydroelectric facilities. Power plants utilizing steam have significant water withdrawals because of the need to cool and condense the recirculating steam. Typically, a power plant will obtain cooling water from a surface water body. The other, much smaller water needs of the power plant, such as boiler makeup water, are typically met by on-site wells or municipal water systems. Table 4-2 lists all major steam-generating power plants in Maryland (excluding self-generators) and quantifies their water withdrawals and consumption for 2013 and 2014. Cooling water withdrawals at steam electric facilities represent the majority of surface water usage in Maryland. In 2014, combined water withdrawal for all steam generating power plants in Maryland is estimated at approximately 5.05 billion gallons per day. All other non-power plant users in the state have a combined appropriation of less than 4 billion gallons per day. By comparison, the Potomac River has an average discharge of roughly 7 billion gallons per day, and the Susquehanna River discharges an average of about 23 billion gallons per day (actual daily flows in both the Susquehanna and the Potomac fluctuate greatly, both seasonally and from year to year). (a) Chalk Point has two units on once-through cooling and two on closed-cycle cooling. The appropriation of 720 mgd covers all four steam units; data on each cooling system individually are not available. (b) AES Warrior Run purchases its water from the City of Cumberland. The surface water appropriation of 0.021 mgd is for backup surface water withdrawals only. Four steam power plants in Maryland – AES Warrior Run, Brandon Shores, Panda Brandywine, and Vienna – use closed-cycle cooling (cooling towers) exclusively instead of once-through cooling. (Chalk Point has multiple steam boilers: two that use once-through cooling and two that use closed-cycle cooling.) Closed-cycle systems recycle cooling water and withdraw less than one-tenth of the water required for once-through cooling; however, depending on plant design and operating parameters, 50 to 80 percent of the water evaporates from the cooling tower and does not return to the source, thus representing a consumptive use. Closed-cycle cooling systems consume 1.5 to 2 times more water per MWh than once-through systems. Nuclear power plants also fall within the steam generating category; however, they use nuclear reactions instead of fossil fuel combustion to create thermal energy. The typical nuclear power plant operating today requires 10 to 30 percent more cooling water, on a per-MWh basis, compared to a fossil fuel plant. Nuclear stations generally operate at a lower steam temperature and pressure compared to fossil fuel-fired generating plants, which causes a somewhat lower efficiency in the conversion of thermal energy to mechanical and, ultimately, electrical energy. Consequently, more waste heat is created per MWh generated than would occur in a fossil fuel plant, and more cooling water is needed to absorb that waste heat. Maryland has one nuclear power plant, Calvert Cliffs, which withdraws an average of 3.2 billion gallons per day from the Bay. This is the largest single appropriation of water in Maryland, and 13 times larger than the municipal supply for the Baltimore City metropolitan area of 250 million gallons per day (mgd). While the majority of this water is returned to the Bay, an estimated 17 mgd of Bay water is lost to evaporation as a result of the heated discharge (see Table 4-2). While the quantity of water withdrawn from a source is fairly straightforward to determine and well-documented by individual facilities, calculating the net or consumptive use is a more complex analysis. By definition, consumptive use is water that is withdrawn but not returned directly to the surface or ground water source and is unavailable to other users. In water-limited or highly regulated systems (rivers with multiple dams and reservoirs), consumptive use is a critical factor in determining allocation and under what conditions competing uses have to be curtailed or prioritized. For power plants with closed-cycle cooling systems, the evaporative losses to the atmosphere can be calculated as the difference between water withdrawn and water discharged. However, most steam plants in Maryland use once-through cooling, in which cooling water is continuously drawn from a water source, used, and then continuously returned to (usually) the same source. While water losses within the cooling system are negligible, the release of heated water results in elevated evaporative losses in the receiving waters – and these losses are not easily measured. PPRP’s assessment of consumptive use is largely based on work conducted in the 1980s by the Interstate Commission on the Potomac River Basin (ICPRB), which calculated in-stream evaporative losses caused by heated discharges from 14 Maryland power plants. The ICPRB found that, on average, in-stream losses were equivalent to about 0.6 percent of a plant’s total discharge volume during the summer and 0.5 percent during the winter. When assessing the significance of water withdrawal impacts, the nature of the source water body is a key factor. In estuaries such as the Chesapeake Bay, and the tidal portions of Bay tributaries, the quantity of water “lost” is less important because tidal influx continually replaces the water withdrawn. In these estuarine environments, the ecological impacts of water withdrawals can be significant, but consumptive loss is not a concern. Click to OpenU.S. Geological Survey Water Use Report In addition to cooling systems, air pollution control systems at power plants can also require substantial amounts of water. As a result of the Healthy Air Act, Maryland’s four largest coal-fired power plants – Brandon Shores, Chalk Point, Dickerson, and Morgantown – have begun operating wet flue gas desulfurization (FGD) systems. Typically, about 85 percent of the water used in these systems is consumptively lost through evaporation out of the stack. Operation of the FGD systems at Maryland’s coal-fired power plants results in an additional evaporative loss of approximately 8 mgd combined. This additional loss is not significant in the tidal estuarine environments at Brandon Shores, Chalk Point, and Morgantown. NRG, the operator of the Dickerson plant, is required to provide on-site water storage to minimize the potential impacts of its FGD system’s water use on other users of the Potomac River (see discussion of low-flow issues in the next section). Consumptive users of water in the nontidal portion of the Potomac River must comply with Maryland’s consumptive use regulations for the Potomac River Basin (COMAR 26.17.07). The intent of this regulation is to ensure that during low-flow periods, upstream users allow sufficient water to continue downstream to supply water demands in the Washington, D.C., metropolitan area. The consumptive use regulations require users consuming more than 1 mgd of water from the Potomac River to maintain low-flow augmentation storage, and release water from this storage to offset their consumption during low-flow periods. Alternatively, users can comply with the rules by reducing consumptive use to less than 1 mgd during low-flow periods. The consumptive use regulations specify the amount of augmentation storage that must be secured to avoid the potential for curtailment of water withdrawals during low-flow periods. A power plant developer can build ponds or tanks to store cooling water, which could carry the facility through a short-term drought. However, it is typically not feasible for plant developers to construct on-site storage that could supply enough water to support operations through a prolonged period of withdrawal restrictions. Plants that propose to withdraw cooling water from nontidal waters of the Potomac, therefore, accept the risk that severe drought conditions may require them to curtail their operations. It is recognized that severe drought conditions correlate quite well with conditions of heavy electricity consumption, but the goal of providing on-site water storage is to reduce the risk of curtailment, not entirely eliminate it. An example of this approach is the CPCN issued to Mirant (now NRG) for construction of the FGD system at Dickerson, which includes a requirement to construct an on-site pond capable of storing 4.5 million gallons to serve the facility during low-flow periods. Similar regulations and policies have been established by the Susquehanna River Basin Commission (SRBC), which was created in 1970 to coordinate the water resource efforts of the Susquehanna River Basin Compact between the states of Maryland, New York, and Pennsylvania. The SRBC’s consumptive use regulation requires users of surface or ground water within the basin to provide mitigation during low flow events, protecting both aquatic resources and other water users. Alternatively, users are allowed to pay a fee to the SRBC in lieu of conducting physical mitigation. The SRBC uses such fees to undertake large-scale storage projects that will offset consumptive water use by those paying the fee. In 2012, the SRBC revised its Low Flow Protection Policy, incorporating low flow thresholds based on monthly or seasonal variability within the water body rather than annual flow thresholds. This provides a more realistic representation of stream conditions and a more appropriate basis to establish protective measures. Old Dominion Electric Cooperative (ODEC) received its SRBC approval in March 2014 for a new cooling water withdrawal on the Susquehanna to supply Wildcat Point, a new combined cycle facility in Cecil County adjacent to ODEC’s existing Rock Springs power plant (See Section 3.1.2). The 1,000 MW Wildcat Point facility will withdraw a maximum of 8.7 mgd of water from Conowingo Pond, of which a maximum of 7.9 mgd will be consumptive use (evaporated in the cooling towers). The Wildcat Point facility is under construction and scheduled to begin operating in Summer 2017. With increasing pressures to minimize water withdrawals, power plant developers are finding more efficient means of cooling. Once-through cooling, the original standard for power plants, is not a viable option for new power plants, particularly in light of EPA’s current regulations for new facilities under the Clean Water Act (CWA) Section 316(b), designed to reduce ecological effects of cooling water withdrawals. Closed-cycle cooling towers have become standard on new steam generating power plants, reducing water withdrawals substantially compared to once-through cooling systems. As noted previously though, their consumptive use is somewhat higher. Click to OpenNew Effluent Guidelines for Coal-fired Power Plant Discharges Environmental regulations to protect the Chesapeake Bay Critical Area and other aquatic make it more difficult to site facilities adjacent to large water bodies, as was common during most of the 20th century. The reuse of effluent from wastewater treatment plants (WWTP) is becoming an acceptable and viable water supply option for power plants to be located close to sources of reclaimed wastewater for cooling water supply, rather than relying on direct surface water withdrawals. The Panda Brandywine combined cycle facility, located in Prince George’s County, currently utilizes about 0.5 to 1 mgd of treated effluent from the Mattawoman WWTP for its cooling water needs. In 2010, Constellation began using treated effluent from Anne Arundel County’s Cox Creek WWTP to supply the FGD system now in operation at the Brandon Shores power plant. Other currently proposed plants that intend to use reclaimed wastewater for cooling water include CPV Maryland’s proposed gas-fired power plant in Charles County and Mattawoman Energy Center’s proposed natural gas combined cycle plant in Prince George’s County (discussed further below). Construction of the CPV Maryland facility began at the end of 2014, and is still ongoing. Effluent reuse has been established as an alternative that can be economically attractive and technically viable for sites located near large WWTPs. With respect to environmental impacts, effluent reuse still represents a consumptive loss of water resources, since the treated effluent that is used and evaporated in the cooling towers would otherwise be discharged to surface water. However, overall aquatic impacts are reduced because effluent reuse does not involve direct withdrawals from a surface water body. Click to OpenNew MDE Guidelines for Use of Reclaimed WaterDry cooling systems are also making significant inroads to the power industry, although there are not yet any major power plants in Maryland with dry cooling. Because of their large size, parasitic power use, required land, and capital outlay, dry cooling towers are more expensive to construct and operate compared to conventional wet cooling systems. However, with increasing constraints on siting and water appropriations, dry cooling is becoming a more attractive option in comparison. The proposed design for the Keys Energy Center combined-cycle facility in Prince George’s County incorporates the use of dry cooling. The use of ground water for process cooling is severely restricted in Maryland, but some of Maryland’s power plants are significant users of ground water for other purposes. Ground water is used for boiler feedwater in coal-fired power plants, inlet air cooling, emissions control in gas- and oil-fired combustion turbines, and potable water throughout the power plants. High-volume ground water withdrawals have the potential to lower the water table of an area, thus reducing the amount of water available for other users. Excessive withdrawals from Coastal Plain aquifers can also cause intrusion of salt water into the aquifer. Although large volumes of ground water are available in the Coastal Plain aquifers, withdrawals must be managed over the long term to ensure adequate ground water supplies for the future. The impact of these withdrawals has been a key issue in southern Maryland, where there is a significant reliance on ground water for public water supply. Currently, five power plants withdraw ground water from southern Maryland coastal plain aquifers for plant operations: Exelon’s Calvert Cliffs Nuclear Power Plant, NRG’s Chalk Point and Morgantown power plants, Southern Maryland Electric Cooperative’s (SMECO’s) combustion turbine facility (located at the Chalk Point plant), and Panda Brandywine’s combined cycle power plant. These five plants have historically withdrawn ground water from three aquifers in Southern Maryland: the Aquia, the Magothy, and the Patapsco. NRG’s Chalk Point power plant began withdrawing ground water from the deeper Patuxent Aquifer in 2010. Two additional power plants utilize ground water: Perryman, located in Harford County northeast of Baltimore, and Vienna, located in Dorchester County on the Eastern Shore. Figure 4-17 shows the ground water withdrawal rates expressed as daily averages from 1975 to 2014 for each of these power plants. The withdrawal rates and associated appropriation limits are also listed in Table 4-3. As noted in Table 4-3, power plants typically withdraw ground water at rates well below their appropriation permit limits. The average withdrawal for all seven power plants in 2014 was 2.4 million gallons per day (mgd) compared to a combined daily appropriation limit of 3.8 mgd. The amount of ground water withdrawn by power plants has fluctuated between about 0.9 and 2.4 mgd over the past 40 years. Note (a): Well was installed in 2007. Routine withdrawal did not occur until approximately 2009. Note (b): Panda was granted a higher appropriation during construction of its pipeline for conveying treated effluent. Note (c): No report was submitted to MDE for the period July-December 2003. The amount shown was estimated using the total volume withdrawn of 4,131,683 gallons reported for the period January-June 2003. Note (d): No report was submitted to MDE for the period January-June 2004. The amount shown was estimated using the total volume withdrawn of 1,505,770 gallons reported for the period July through December 2004. Three government agencies – the Maryland Geological Survey (MGS), the USGS, and PPRP – jointly operate a ground water monitoring program to measure the water levels in the Coastal Plain aquifers of Southern Maryland to ensure the long-term availability of ground water. MDE Water Management Administration (WMA), the permitting authority for all ground water appropriations, uses the data from this joint monitoring program to assess the significance of impacts to aquifers when reviewing additional appropriation requests. 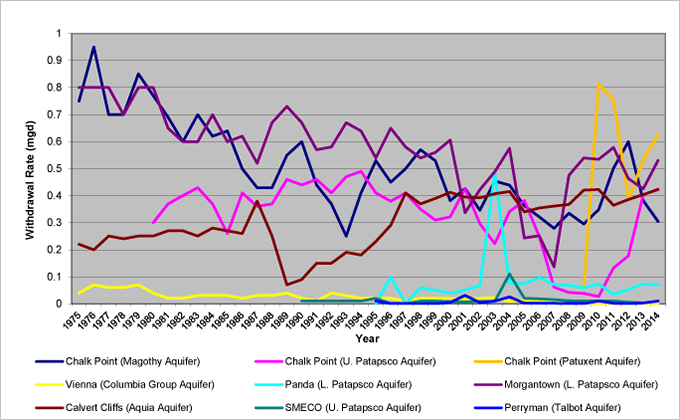 Click to OpenEvaluating Drawdown ImpactsLong-term monitoring indicates a steady decline in water levels in the Aquia, Magothy, Patapsco and Patuxent aquifers. However, these declines are not solely due to withdrawal by power plants, and are considered acceptable by MDE WMA when compared to the amount of water available in the aquifers. The amount of water available is expressed as the aquifer’s “available drawdown,” which is defined in MDE regulations as 80 percent of the distance from the historic pre-pumping water level to the top of the pumped aquifer. While power plants have contributed to the decline in the water levels in these aquifers, increased withdrawals from municipal well fields in southern Maryland have caused most of the recent declines. To minimize impacts to municipal supplies, MDE WMA has required industrial users to utilize the deeper aquifers for new withdrawals. Water quantity impacts to each of the Coastal Plain aquifers are summarized below. Aquia Aquifer at Calvert Cliffs – Water levels in the Aquia Aquifer at Calvert Cliffs declined approximately 75 feet from 1982 to 2013, with most of the decline occurring post 1990. This acceleration in water level decline is due to withdrawal from municipal well fields at Lexington Park in St. Mary’s County and Solomons Island in Calvert County. The water levels at Lexington Park and Solomons Island have declined nearly 113 feet and 96 feet, respectively, since 1982. 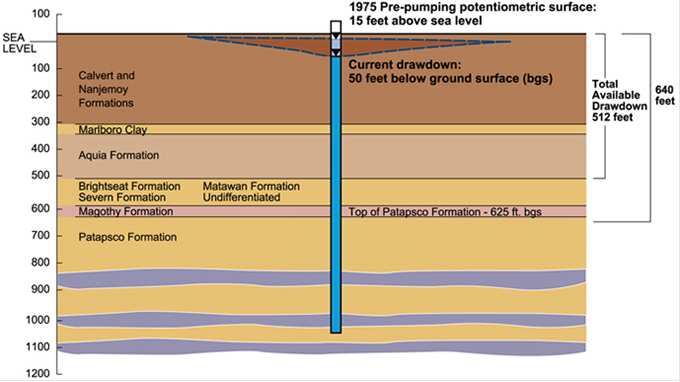 The impacts from the water level decline are considered acceptable given the estimated 315 feet of available drawdown in the Aquia Aquifer at Calvert Cliffs based on MDE’s available drawdown criteria described above. Magothy Aquifer at Chalk Point – MDE WMA has required industrial users of the Magothy Aquifer to use deeper aquifers like the Patapsco to allay concerns over water level declines in the Magothy. As a result, the Chalk Point power plant reduced its ground water withdrawal from the Magothy from 1990 to 2013 by about 40 percent compared to its withdrawals prior to 1980. This reduction has resulted in a commensurate decrease in the rate of water level decline at the facility during this same period. However, water levels continue to decline in the aquifer due to its extensive continued use in Annapolis and Waldorf. The drawdown at Chalk Point between 1975 and 2013 has been approximately 42 feet, and a total of about 82 feet since pumping at Chalk Point began in 1964. Prior to pumping in 1962, the elevation of the potentiometric head in the Magothy Formation was 28 feet above mean sea level; thus the available drawdown is 80 percent of 600 feet plus 28 feet, approximately equivalent to 500 feet. Consequently, the total drawdown of 82 feet is small compared to the estimated total available drawdown of approximately 500 feet for the Magothy Formation in the vicinity of Chalk Point. Upper Patapsco Aquifer at Chalk Point – The water level surface in the Upper Patapsco Aquifer declined 43 feet at Chalk Point since 1990. This decline will not impact the approximately 512 feet of available drawdown in the Upper Patapsco Aquifer at Chalk Point. Lower Patapsco Aquifer at Morgantown – The water level surface of the Lower Patapsco Aquifer in the vicinity of the Morgantown power plant has declined up to 29 feet since 1990. Water levels in the vicinity of the Morgantown power plant have increased about 5 feet since 2009. Patuxent Aquifer at Chalk Point – The water level surface of the Patuxent Aquifer has declined approximately 40 feet as a result of withdrawal at the Chalk Point power plant. Water levels in the immediate vicinity of the power plant have declined approximately 70 feet between 2009 and 2013, as a result of the use of the Patuxent Aquifer beginning in 2009. In several recent licensing cases, PPRP has worked with MDE to address issues related to ground water contamination. These instances of contamination were not caused by power generation or transmission activities; however, the applicants in these licensing cases had to take measures to avoid exacerbating the negative impacts. PPRP has conducted in-depth evaluations in each of these cases and developed CPCN conditions to establish requirements for the applicants. Ground water quality in the vicinity of the proposed Perryman 6 Project facility has been impacted by a release of fuel to the subsurface. The source of the contamination was a leaking No. 2 fuel oil line immediately west of combustion unit No. 4. Results of initial investigations identified an area roughly equivalent to five acres of free phase oil within the property boundaries. In an effort to mitigate the plume migration, skimmers were installed and adsorbents were used to recover as much oil as possible. Currently, ground water monitoring is conducted as part of an active MDE Oil Control Program case that includes monitoring of oil and water level measurements and dissolved phase petroleum-related contaminants. Recent monitoring results indicate that the residual dissolved petroleum plume extends towards the west and is elongated in a northeast-southwest direction. Based on current total petroleum hydrocarbon diesel range organic concentrations measured in monitoring wells, the current area of the plume is approximately 2.5 to 3.0 acres. The results of investigations conducted in 2011 and 2012 indicate that the majority of the remaining liquid phase hydrocarbon is present at residual, immobile saturation, and is therefore trapped in isolated pores in discontinuous pockets by capillary forces. The withdrawal of ground water is required for the operation of the Perryman plant. However, pumping ground water from the Upper Aquifer has the potential to cause impacts to the ground water quality if the reduction in the water table elevation or an alteration in the ground water flow directions disperses the oil plume. The results of the steady-state Non-Steady or Steady State Coupled (NSSCOU) aquifer model were used to evaluate the potential for these water quality impacts to be realized. The steady-state NSSCOU model results indicated that drawdown ranging from 0.1 feet to 0.15 feet could occur in the area of the oil plume. This slight drop in the water table would not alter the ground water flow direction, indicating that the pumping would not disperse the oil plume. Therefore, the model results indicate that lowering the water table will not alter the extent of the oil plume. The planned generator lead line for Mattawoman will traverse the Brandywine DRMO Superfund site, which is owned by Joint Base Andrews (JBA). Chlorinated VOCs are present in ground water at the DRMO Superfund site and were observed to be migrating offsite into a residential area. JBA is currently operating a groundwater extraction and treatment system at the DRMO Superfund site to capture and treat a chlorinated VOC plume that is migrating offsite. JBA raised concern that dewatering activities at the Mattawoman site will influence groundwater flow at the DRMO site and adversely impact plume capture/migration and their ongoing remediation. As a part of the CPCN review process, Mattawoman conducted a dewatering evaluation to determine potential affects to the DRMO remediation system caused by construction dewatering at the proposed Mattawoman site. PPRP also conducted an independent analysis to evaluate the findings of “no significant impact” to the DRMO system from Mattawoman construction activities. Licensing conditions imposed on Mattawoman were created to assure protection of human health during transmission pole installation for the generator lead line. Likewise, the licensing conditions also specified requirements to reduce/minimize further releases of contaminated soil or ground water to non-impacted areas such that the surrounding community would not be affected. PEPCO filed an application for the rebuild of an existing 230 kV transmission line originating at the Burtonsville substation and terminating at the Takoma substation. In its application, PEPCO acknowledged that there are three areas along the right-of-way (ROW) that could contain petroleum-contaminated soil or areas where hazardous substances may be present in soil or groundwater. The presence of oil-contaminated soil or hazardous substances is the result of releases caused by entities other than PEPCO whereby such substances have migrated onto the PEPCO ROW. However, to ensure the safety of its workers, PEPCO committed to conduct investigations to determine the presence of soil and/or ground water contamination at the structure locations to the depths of proposed excavations prior to initiation of construction and to use the results to the investigation to determine the course of action to mitigate potential risks from contamination during construction. Click to OpenDewatering for Pipeline Construction License conditions were imposed on PEPCO to address concerns regarding worker health and safety and management and disposal of excavated materials impacted with hazardous substances, and ensure PEPCO delivers on the commitments set forth in the CPCN application. To achieve the license conditions, PEPCO was required to conduct necessary analytical testing of the soil and groundwater near the structure locations that could be affected by subsurface contamination. PEPCO was also required to prepare plans for soil and groundwater management to include plans for health and safety, excavation, containment and disposal. The License Conditions also require that PEPCO compare the results of the analytical data collected as part of the investigation to MDE’s Cleanup Standards for Soil and Groundwater. Analytical data for soil must be compared to residential cleanup levels to ensure protection of residents living adjacent to the Project ROW. Should analytical data for soil exceed the MDE standards for residential soil, PEPCO must adhere to proper disposal of impacted soil at a licensed solid waste facility in accordance with MDE’s solid and hazardous waste laws and regulations. Impacted soil may not remain within the Project ROW. If groundwater is determined to contain hazardous substances exceeding MDE’s standards, procedures may be developed and implemented to ensure that impacted groundwater is either treated or disposed of in accordance with all applicable local, State, and federal laws and regulations. Electric power generation facilities have the potential to impact the state’s water resources from water withdrawal, consumption and discharge during plant operations. Impacts on rivers and estuaries from surface water withdrawal and consumption may include a reduction in river flow volumes due to evaporative water loss in the plant’s cooling system, as well as mortality of aquatic organisms as a result of entrainment in the cooling system, and impingement of larger organisms on cooling system intake screens as mentioned above. Elevated temperatures of receiving waters from a plant’s discharge may also have an effect on aquatic resources. Impacts to fish in streams include the potential loss of habitat due to lower water levels or altered water temperature particularly during low flow periods if a plant’s use of cooling water significantly affects downstream flow. Water usage and the resulting environmental impacts have been monitored by various agencies and organizations. These issues have been a major responsibility of PPRP since it was established in 1972. In systems where multiple sources of potential impacts can affect water quality and aquatic habitats, the combined effects may compound or intensify the effects of the individual sources, and accumulate in downstream areas (see Section 4.2.1 – Cumulative Effects on Biological Sources). In addition to minimizing impacts, several power plants have instituted cooperative aquatic enhancement measures at their facilities, such as constructing and operating game fish hatcheries in cooperation with the Maryland Department of Natural Resources (DNR). Other power plants have established funds to remove fish migration obstructions caused by low-head dams no longer in use. The types of impacts identified by PPRP, along with the steps taken to minimize and mitigate these impacts are discussed in greater detail below. The impacts associated with cooling water withdrawals in the state are expected to be re-evaluated for regulatory compliance in the next several years because of EPA’s revised Section 316(b) regulations of the CWA for existing power plants. Entrapment – accumulation of fish and crabs (brought in with cooling water) in the intake region. Click to OpenSummary of Impingement and Entrainment Studies (Download Adobe Acrobat Reader) In the 1970s and early 1980s, PPRP evaluated impacts to aquatic organisms at eleven major power plants. The studies were used to evaluate the relative impacts of power plant operations on the aquatic environment, with special emphasis on the Chesapeake Bay (see sidebar on impingement and entrainment studies). Results of the studies showed that while power plant operations affect ecosystem elements, the cumulative impacts to Maryland’s aquatic resources are not ecologically significant. Although entrainment losses of aquatic organisms were measured, they did not reveal consistent depletions of populations. Click to OpenClean Water Act Section 316(b)Even then, some power plants modified their operating procedures and one constructed on-site hatchery facilities for fish stocking operations. They also provided funding to remove blockages to migratory fish and developed improved intake technologies and other modifications to reduce entrainment or impingement. Section 316(b) of the federal Clean Water Act requires power plants to use cooling water intake structures (CWIS) that reflect the best technology available for minimizing adverse environmental impacts. After several decades, the U.S. EPA implemented a final rule on requirements for CWIS at existing facilities (see sidebar). Impacts to aquatic biota from power plant cooling water system discharges include elevated temperatures, discharge of chemicals used for biofouling treatment (e.g., chlorine), discharge of metals eroded from internal plant structures (e.g., copper), and, in the case of Maryland’s only nuclear power plant, discharge of radiological materials (see Section 4.5 for more information). Each of these impacts is discussed below. Biological impacts from heated effluents depend upon the magnitude and duration of the temperature difference between discharge water and receiving water. Small organisms that pass through a plant’s cooling system experience the greatest temperature stress, both in magnitude and duration. Exposed organisms in the receiving waters are more likely to experience smaller increases in temperature of shorter duration due to dispersion of the thermal plume and mobility of most of the exposed aquatic biota (e.g., fish, blue crabs). PPRP and plant owners conducted studies to determine the effects of thermal discharges at each existing power plant in the state. 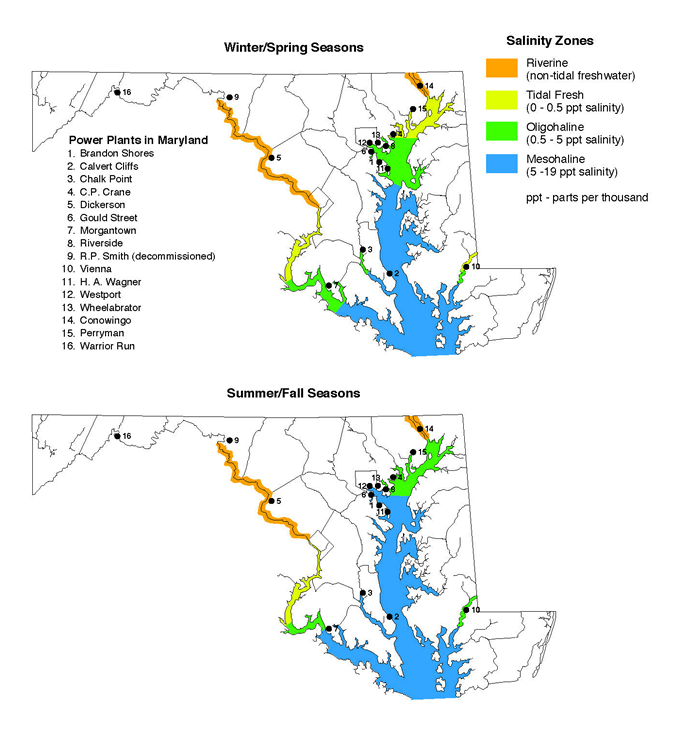 Because different aquatic biota occupy different salinity regimes in Maryland waters, study results are presented here according to the habitats where power plants are located (see Figure 4-18). Below is a brief summary of the findings in those studies. Mesohaline Habitat – The largest power plants (by generating capacity) in the state discharge into mesohaline habitat (5-19 parts per thousand (ppt) salinity) during all or part of the year. PPRP studied thermal discharges from the Chalk Point, Morgantown, Calvert Cliffs, and H.A. Wagner power plants as part of extensive fieldwork in the 1970s and 1980s. Thermal plume dimensions for these power plants varied with season, tidal stage, wind velocity and direction, and plant operating levels. The effects of thermal discharges from the power plants located in the mesohaline habitats of the Chesapeake Bay are localized and not considered significant. PPRP found no cumulative adverse impacts to the habitats of the Chesapeake Bay ecosystem. However, PPRP will continue to evaluate the habitats if additional power plant discharges are proposed; new technology would then be considered to reduce thermal discharges. More recently, PPRP studies have evaluated the potential effects of power plant discharges on diving ducks and their food resources. Tidal Fresh and Oligohaline Habitat – Two plants, Vienna and C.P. Crane, discharge into tidal fresh (0-0.5 ppt) and oligohaline waters (0.5-5 ppt). Chalk Point also discharges into the oligohaline zone during part of the year. PPRP studies showed that the thermal plume at Vienna was small and its discharge effects were negligible. The thermal plume at C.P. Crane affected about 40 percent of the volume of the receiving water embayment. C.P. Crane effluents also resulted in a slight increase in nearfield salinity due to plant-induced changes in the nearby bay circulation pattern, but these factors did not affect nearfield dissolved oxygen. In the early 2000s, MDE required studies at C.P. Crane to repeat some of the historical fishery surveys conducted in the late 1970s, as a condition for NPDES permit renewal. The purpose of the surveys was to demonstrate that the fish populations in the vicinity of the C. P. Crane power plant remain unaffected by its thermal discharge. The study showed that differences in the fish community apparent between the 2003-2005 results and the results of the 1979-1980 study reflect long-term changes in the upper Bay fish community and are not suggestive of a plant discharge effect. The results also suggest that the thermal discharge does not consistently affect the fish community’s composition or distribution. Findings at the plants in these tidal fresh and oligohaline habitats were consistent with those at facilities in mesohaline areas. Thermal discharge effects were small and localized. PPRP studies found no evidence that fish movements were blocked by thermal plumes in the plants’ receiving waters in these particular habitats. Nontidal Freshwater Habitat – Dickerson is the only Maryland power plant that uses once-through cooling and is located in nontidal riverine habitat. The thermal impact of power plant discharges on the Potomac River ecosystem was assessed in a long-term freshwater benthic study conducted by PPRP over an eight-year period in the 1980s. While this long-term study documented that the thermal discharges from Dickerson had an adverse impact on benthic communities in the immediate area of the discharges, these effects were localized. The affected percentage of the total river bottom is very small. To assess whether these localized impacts on benthic communities may be affecting fish populations within the river, the discharge permit for the Dickerson facility included a requirement for a multi-year study of growth and condition of several fish species in the vicinity of the plant. Based on data on fish condition collected over a 21-year period near the plant and at reference locations, there was no indication that fish near the plant were affected by the localized discharge effects on benthic communities. Concerns regarding the impacts of copper and chlorine discharged from cooling water systems into sensitive waters of the Chesapeake Bay watershed in the late 1970s and early 1980s led to extensive studies by PPRP as well as others. Copper – In the late 1970s and early 1980s, oysters in the vicinity of the Chalk Point, Calvert Cliffs, and Morgantown power plant discharges were found to be bioaccumulating copper that was present in the effluent discharge. The copper resulted from corrosion of the copper condenser tubes within the plants’ cooling systems. While PPRP studies showed that oyster growth and survival were not adversely affected, the elevated levels of copper concentrations in oysters posed a potential risk to the health of individuals who might consume them. Power plants replaced the copper condenser tubes with titanium tubes where this problem was most significant, primarily in estuarine waters. The titanium tubes eliminated the metals corrosion, which also resulted in less maintenance on the condenser tubes. Currently, NPDES permitting for all power plant discharges includes an evaluation of maximum discharge levels for copper (as well as other metals) to protect human health and the environment. Chlorine – This substance is sometimes used by power plants to control bio-fouling of condenser tubes in cooling water systems. While it may be an effective means of controlling biological organisms within the cooling system, it can also cause mortality in the aquatic biota of the receiving water body. Presently, the NPDES permits for all power plants in Maryland require that chlorine not be discharged into the state’s waters for more than two hours in any one day from any one unit, and no more than one unit may discharge at any one time. An exception may be granted if a facility demonstrates that more chlorination is needed to control macroinvertebrates. Chlorinated discharge impacts are now considered resolved and no further action is needed. Wastewater discharged from coal ash ponds, air pollution control equipment, and other equipment at power plants can contaminate drinking water sources, impact fish and other wildlife, and create other detrimental environmental effects. Although air pollution controls have made great strides in reducing emissions from power plants, some of the equipment used to clean air emissions does so by “scrubbing” the boiler exhaust with water (“wet” flue gas desulfurization (FGD) systems), which then can pollute rivers and other receiving water bodies. Treatment technologies are available to remove these pollutants before they are discharged to waterways, but these systems have been installed at only a fraction of the power plants. Types of treatment systems for FGD systems include settling ponds, chemical precipitation, biological treatment, constructed wetlands, and zero-liquid discharge. In 2009, EPA completed a multi-year study of power plant wastewater discharges and concluded that current regulations, which were issued in 1982, have not kept pace with changes that have occurred in the electric power industry over the last three decades. As part of this multi-year study, EPA measured the pollutants present in the wastewater and reviewed treatment technologies, focusing mostly on coal-fired power plants. Many of the toxic pollutants discharged from these power plants come from coal ash ponds and the FGD systems used to scrub SO2 from air emissions. In 2009, EPA announced plans to revise the existing standards for water discharges from coal-fired power plants to reduce pollution and minimize its adverse effects. More information about EPA’s study is provided in a report (Download Adobe Acrobat Reader) that was published later that year. EPA issued a proposed rule to amend guidelines and standards for the steam electric power generating industry in 2013 and took final action in November 2015. Now that the new rule for electric power plants has been finalized, EPA and states are incorporating the new standards into wastewater discharge permits. In addition to the contaminants covered under EPA's effluent guidelines, and as a result of the implementation of the Chesapeake Bay TMDL, all dischargers with NPDES permits, including industrial dischargers such as power plants, will have reduced limits on total nitrogen, total phosphorus, and sediment. Changes in water quality – Impoundments created for hydroelectric dams significantly alter river flow from free-flowing streams to deepwater flow. This alteration causes changes in natural water clarity, thermal stratification, and lower dissolved oxygen concentrations upstream of the dam, which, in turn, may result in low dissolved oxygen levels in the water discharged from the dam. Changes to flow regime – Operating hydroelectric facilities in a peaking mode (in response to peak electrical demand) produces unnatural and frequently extreme water level fluctuations in impoundments as well as downstream from the dams. Additional small-scale projects may also divert some flow away from the natural streambed. Fluctuations in water level and flow may reduce fish abundance as well as important food sources essential to fish growth and survival. In addition, large hydroelectric dams allow suspended sediments to accumulate in the impoundment resulting in reduced storage, reduction in navigational waters, and changes in the timing and distribution of sediment and associated nutrients downstream of the dam. Direct adverse effects on fish populations – Dams prevent the natural upstream and downstream movement of both resident and migratory fish species. Entrainment of fish attempting to move downstream past the dam may cause mortality due to the turbines. Factors that affect fish mortality include the type of turbine, the proportion of flow diverted through the turbine, and the size of fish. Historically, the Susquehanna River supported large spawning runs of migratory species such as American shad, river herring, striped bass, and American eel. The massive diadromous fish migrations extending as far upstream as Cooperstown, New York, were eliminated with the construction of four major hydroelectric facilities on the lower Susquehanna in the early 1900s (Maryland’s Conowingo Dam, and Holtwood, Safe Harbor, and York Haven dams in Pennsylvania). By the year 2000, restoration programs had been operating for nearly 30 years, and fish passage devices had been installed at all four hydroelectric facilities, partially re-opening the Susquehanna River to migratory fish. This has created the potential for shad and other migratory fishes to move as far upstream as New York State, representing renewed access to well over 400 miles of historic habitat. However, fish passage has only been partially successful to date and additional studies are being conducted at several of the lower river projects to address these issues as part of relicensing. Growth of the Susquehanna River shad stock in response to the restoration efforts and installation of fish passage devices has been problematic. 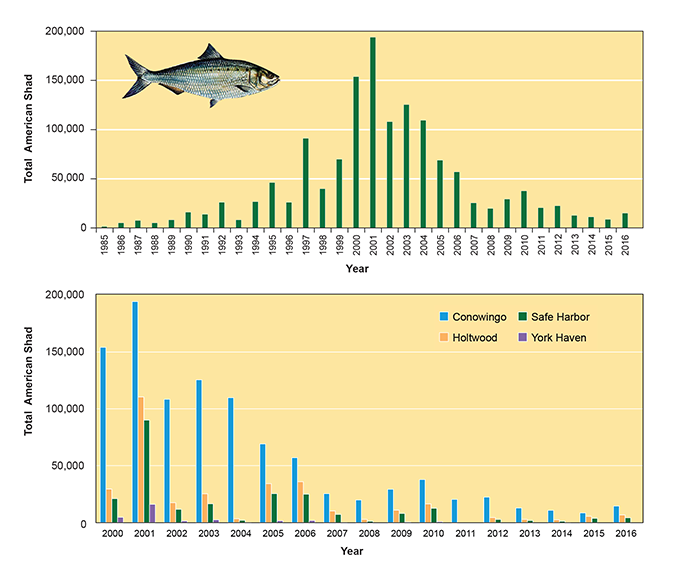 Growth peaked in 2001, when nearly 200,000 American shad were passed over Conowingo Dam, but has since declined for reasons that are the subject of ongoing studies and potential mitigation measures (see Figure 4-19). The 2014 fish passage data indicate that only 24.2 % of what passed Conowingo passed Holtwood. The Holtwood numbers have historically been low, but better fish passage made in conjunction with recently added generation resulted in a large increase to over 63% of fish that had passed Conowingo in 2015 and 47% in 2016. Long-term (2000-2016), Safe Harbor has passed 76% of what passed Holtwood, but York Haven only passed 13% of what passed Safe Harbor. PPRP, working with dam owners and other state and federal agencies, is continuing efforts to enhance upstream migratory fish passage as well as safe downstream passage of juveniles through operational and/or engineering modifications. Similar to shad, American eels likely occupied the majority of the Susquehanna Basin, but have been restricted from accessing the majority of the Susquehanna since the mainstem dam construction. Eel densities in the tributaries to the lower Susquehanna River below Conowingo Dam are higher than other Chesapeake Bay tributaries. Young eels may be attracted to the discharge of the Susquehanna River, but they are unable to migrate up the mainstem. The loss of eels, one of the most abundant fish in the watershed, has additional effects on the Susquehanna River ecosystem. The freshwater mussel, eastern elliptio (Elliptio complanata) is the most abundant mussel species in the mid-Atlantic, but its abundance in the Susquehanna River is lower than other regional watersheds (i.e., Delaware River). Freshwater mussels require a host, usually a fish, to complete their reproductive cycle. Eels serve as an important host species for eastern elliptio in the region and their disappearance from the watershed has likely played a significant role in the limited abundance, size, age, and recruitment of their populations. Since 2009, the U.S. Fish and Wildlife Service (USFWS) has operated an eel ramp to capture juvenile eels below Conowingo Dam and move them upstream. The goal of this program is to move 1 million eels to designated locations within the watershed to not only restore mussels but to restore the ecological balance. Eels quickly bring balance back to the ecosystem by their predation on small fishes and crayfish. The collected number of elvers (young eels) increased from 2009 through 2013 (Table 4-4); however, the past two years (2014-2015) have seen a decline in the number collected. The 58,444 elvers collected in 2015 was below the 11-year average of 76,040. This could be related to the unusual weather conditions in 2015, or this long-term trend could be related to natural variability in eel numbers. Source: USFWS, 2015. American Eel: Collection and Relocation Conowingo Dam, Susquehanna River, Maryland. 2015. The FERC licenses for three of the five lower Susquehanna facilities (Conowingo, Muddy Run, and York Haven) expired at the end of 2014, and agency consultation on relicensing has been underway since 2009. Licenses have been renewed for York Haven and Muddy Run, but studies on sediment, fish passage, and downstream flow are continuing for the relicensing of Conowingo (see further discussion below). Holtwood and Safe Harbor project licenses expire in 2030. The Conowingo Dam completed in 1928 created the 8,500 acre Conowingo Pond (reservoir); additional generating units added in the 1960s and upgrades in the recent decade resulted in the 573 MW Conowingo Hydroelectric Project. In addition to the types of impacts mentioned that are generally caused by hydroelectric facilities, impacts specific to Conowingo also include increased evaporation and sedimentation. The Conowingo Pond also supports other generating facilities nearby in Pennsylvania, including the 2,186 MW Peach Bottom Atomic Power Station, the 800 MW Muddy Run Pumped Storage Project and the 1,100 MW York Energy Center, as well as municipal water supply for Baltimore City and Chester, PA. The federal license to operate the Conowingo Project (owned by Exelon) expired in August 2014, along with the licenses of two other hydroelectric projects in the lower Susquehanna River in Pennsylvania (Muddy Run, also owned by Exelon, and York Haven; licenses for these 2 projects have since been renewed for 40-year terms). Licenses for the other two lower Susquehanna River hydroelectric projects expire in 2030 (Holtwood and Safe Harbor). The Federal Energy Regulatory Commission (FERC) has the authority to issue the license for Conowingo, although with significant regulatory input from Maryland (with PPRP as the lead for the state) and other federal agencies. Studies and discussions have been taking place since 2009 between Exelon and various natural resource agencies and other interested parties. Relicensing participants include FERC, Exelon, Maryland (DNR and MDE), Pennsylvania (Fish and Boat Commission and Department of Environmental Protection), U.S. Fish and Wildlife Service, National Marine Fisheries Service, National Park Service, Susquehanna River Basin Commission, The Nature Conservancy, and the Lower Susquehanna Riverkeeper. Modifying the East Fish Lift to provide 900 cubic feet per second of attraction flow. Replacing the current 3,300-gallon hopper at the East Fish Lift with two 6,500-gallon hoppers. Reducing cycle time at each hopper at the East Fish Lift to be able to lift fish four times per hour. Completing modifications to the East Fish Lift structure to allow for trapping and sorting fish at the East Fish Lift facility and transporting them to the western side of the dam to a truck for transport upstream. Modifying the West Fish Lift to facilitate trap and transport. Constructing and maintaining structures, implementing measures, and/or operating the Project to provide American shad and river herring a zone of passage to the fish passage facilities. Evaluating potential trapping locations for American eel on the east side of Conowingo Dam including Octoraro Creek starting in May of the first calendar year after license issuance or immediately if license issuance occurs during the upstream American eel migration period. In addition to these initial construction items, Exelon will trap and transport American shad and river herring from Conowingo to above the York Haven Hydroelectric Project beginning the first fish passage season after license issuance. Exelon also has committed to trap and transport American eels at the west side of Conowingo Dam. Exelon will also conduct periodic efficiency tests of migratory fish passage through its improved facilities. If the project doesn’t achieve specified passage goals, additional mitigation measures from a tiered list of items will be implemented to make further improvements in passage efficiency throughout the term of its license. In March of 2013, the Maryland legislature passed a bill supporting offshore wind. Although no offshore wind energy projects have been constructed in the U.S., a number of large projects have been proposed, most in shallow waters (<30 m depth) off the Atlantic Coast. The development of large offshore wind farms will also require underwater transmission infrastructure, such as the proposed Atlantic Wind Connection (see Section 5.5.1 for detailed description of legislation and project), which has the potential to impact natural resources in this region. Effects on marine resources and on avian and bat populations from the construction and operation of these offshore generation facilities will need to be fully evaluated. Risks range from mortality due to collisions with turbines to exposure to chemicals resulting from accidental spills. Migratory routes, breeding and feeding areas could be affected. High fatalities of several species of bats have been recorded at land-based wind energy projects especially in the eastern U.S. Electric transmission from wind farms also creates electromagnetic (EMF) fields which are known to affect the behavior of some fish, such as eels, rays, and sharks. The potential effects of the construction and operation of generation facilities on Maryland’s rare, threatened and endangered species (RTE) need to be considered for every project. For example, the state-endangered Northern Map Turtle (Graptemys geographica) occurs only in the lower Susquehanna River in Hartford and Cecil Counties in Maryland, which is the eastern edge of its range. Impacts from habitat modification and human recreation are of special concern for Map Turtles in Maryland. Flows of the lower Susquehanna River are influenced by generation from the Conowingo Hydroelectric Dam and the river below the dam is heavily used for recreational activities. Given the potential impacts of the Conowingo Hydroelectric Dam and associated human recreational use of the river, the Maryland DNR funded a three-year study to examine the status, distribution, and ecology of Northern Map Turtles in Maryland. A full list of the State’s RTE species can be found at http://dnr2.maryland.gov/wildlife/Pages/plants_wildlife/rte/espaa.aspx. Federally listed threatened and endangered species that occur in the Chesapeake Bay and coastal waters of Maryland that could potentially be affected by offshore generation facilities include fish, whales, and sea turtles (see http://www.fws.gov/chesapeakebay/EndSppWeb/LISTS/specieslist-md.html for complete list). Except for sea turtle nesting habitat, principal responsibility for these species is vested with the National Oceanic and Atmospheric Administration Fisheries Service. Although permit requirements and regulations may not require an assessment of cumulative effects, the health of the contiguous ecosystem is determined by the impact of multiple influences. PPRP has conducted aquatic impact assessment studies at all of Maryland’s existing plants and has identified no measurable cumulative adverse impacts on water resources. MDE issues discharge permits, in accordance with the CWA, and uses aquatic impact assessment data to monitor continued performance of power plants to minimize these impacts. Cumulative effects of additional generation facilities such as offshore wind will need to be considered. Staley, Andrew W., David C. Andreasen, and Stephen E. Curtin. Potentiometric Surface and Water-Level Difference Maps of Selected Confined Aquifers in Southern Maryland and Maryland’s Eastern Shore, 1975-2013. MGS Open-File Report No. 14-02-02, Prepared in cooperation with DNR-PPRP and the U.S. Geological Survey. DNR Publication No. 12-552014-712, 2014. Seigel, Richard A., T. M. Richards, K. Anderson, and N. Byer. 2012. Interim Report: Nesting and Basking Ecology of Northern Map Turtles in the Susquehanna River: Impacts of Human Disturbance and Effectiveness of Mitigation Measures. Department of Biological Sciences, Towson University, Towson, MD 21252. December 2012. Diadromous is a general category describing fish that spend portions of their life cycles partially in fresh water and partially in salt water. These represent both anadromous (fish that migrate from the sea up into fresh water to spawn, such as American shad) and catadromous (fish that migrate from fresh water down into the sea to spawn, such as American eel). The U.S. Geological Survey (USGS) develops water use reports for the United States every five years. The latest USGS water use report, published in November 2014, details national water usage data for the year 2010, as well as trends in water use from 1950 through 2010. USGS estimates that, in 2010, 161 billion gallons per day was withdrawn from surface freshwater sources for thermoelectric power generation in the US. Maryland accounts for about 3% of that withdrawal volume. The report does not include consumptive use data; however, USGS researchers are actively working on development of more accurate estimates of water consumption associated with power plant cooling systems. The U.S. EPA first promulgated the Steam Electric Power Generating Effluent Guidelines and Standards (40 CFR Part 423) in 1974, and it recently amended these regulations with a final rule published in November 2015. This rule sets the first federal limits on the levels of toxic metals in wastewater that can be discharged from power plants, including aggressive limits for selenium and mercury. It establishes new or additional requirements for wastewater streams from the following processes and byproducts associated with steam electric power generation: flue gas desulfurization (FGD), fly ash, bottom ash, flue gas mercury control, and gasification of fuels such as coal and petroleum coke. As the NPDES permits for Maryland’s coal-fired power plants come up for renewal, MDE is incorporating the new effluent guidelines to set new limits that are achievable using best available technology. PPRP provided technical assistance to MDE in 2014, when the EPA regulations were still in the proposed rulemaking stage, to identify the status and capabilities of effluent control methods. Under §9-303.1(a) of the Annotated Code of Maryland, MDE is directed to encourage use of reclaimed water as an alternative to discharging treated sewage effluent to surface waters of the State. Two power plants in Maryland – Panda Brandywine and Brandon Shores – have been utilizing high-quality reclaimed wastewater for many years, avoiding the need for large volume surface water withdrawals to provide cooling water and, in the case of Brandon Shores, makeup water for air pollution control systems. Physical infrastructure requirements (e.g., pipe color, installation process). WWTPs providing Class IV reclaimed water to industrial users must now meet these new guidelines. The standards are generally consistent with conditions that PPRP and MDE have recommended in past CPCN licensing cases, and that the PSC has included when approving new or modified facilities that use reclaimed water for cooling. Long-term monitoring data show how pumping from a ground water aquifer affects the water level over time. MDE regulations define “available drawdown” in an aquifer as 80 percent of its historic pre-pumping level. The significance of the current drawdown can then be estimated by comparing current drawdown to the total available drawdown (see drawing below for an illustrated example). Dewatering of saturated materials during the construction of power plants, including pipelines, may be required when construction occurs in areas with a high water table, such as areas in the coastal plain of Maryland. A complete understanding of the influence that dewatering may have on the aquifer is necessary to avoid significant impacts to surrounding surface water resources, such as streams and ponds, and nearby ground water users. PPRP has conducted analyses in recent licensing cases to ensure that proposed pipelines associated with generating facilities will not deplete ground water resources or affect nearby water users. Duration of pipeline construction and average construction duration of each segment. PPRP uses this information to conduct a hydrogeologic analysis of the site, and estimate water table drawdown associated with the construction dewatering. PPRP determines the extent of the impacts to nearby ground water users, subject to ground water appropriation applicability under State regulations, in close coordination with MDE Water Management Administration. This dewatering approach was applied to the Mattawoman Energy Center project. An 8-mile gas and a 10-mile reclaimed water pipeline were proposed for installation as part of the Mattawoman natural gas-fired power plant. Mattawoman calculated the duration and rate of dewatering for the first mile of the reclaimed water pipeline. The mile-long pipeline route was segregated into four segments, with the boundaries of each segment corresponding to major stream crossings. These segments were then evaluated using the methodology described above to determine if dewatering would be necessary for each segment, and if dewatering was deemed necessary, the amount of dewatering that would occur for each segment. Based on Mattawoman’s calculations (confirmed by PPRP), all four segments needed an appropriation approval through a CPCN amendment. In February 2016, the Public Service Commission granted the CPCN amendment to Mattawoman to modify the ground water appropriation permit to accommodate construction dewatering for the first mile of reclaimed water pipeline. EPA’s implementation of Clean Water Act (CWA) Section 316(b) has resulted in updated assessments of the impacts of cooling water withdrawals. EPA’s regulation included three phases of implementation: Phase I applied to new facilities constructed after January 2002 with cooling water intake; Phase II, effective September 2004, applied to existing power-producing facilities, with cooling water intake designed for greater than 50 mgd (the regulations would be applied at the time the facility renewed its National Pollutant Discharge Elimination System (NPDES) discharge permit); and Phase III applied to non-power producing facilities. Maryland has eleven existing steam electric power plants with an NPDES permit and a cooling water intake and discharge. Of these, two plants were below the 50 mgd design threshold for Phase II facilities (Warrior Run and Vienna), one was classified as exempt from the new regulations (Wheelabrator/Baltimore RESCO), and the remaining eight (Calvert Cliffs, Chalk Point, C.P. Crane, Dickerson, Gould Street, Morgantown, Riverside, and Wagner-Brandon Shores) have conducted Phase II evaluations. The Phase II regulations established specific performance standards for reduction of impingement and entrainment, and identified five compliance alternatives for using best technology available to minimize adverse environmental impact at facilities. However, as a result of a lawsuit by several environmental groups, states, and industry groups, the U.S. Court of Appeals made a ruling on Phase II, rejecting many of its provisions (Riverkeeper et al. v. USEPA, decided January 2007). A portion of this ruling with respect to the cost-benefit test was appealed to the U.S. Supreme Court. The court ruled in 2009 that the cost-benefit test is allowed; specifically, the court stated: “The EPA permissibly relied on cost-benefit analysis in setting the national performance standards and in providing for cost-benefit variances from those standards as part of the Phase II regulations.” EPA proposed a revised rule for public comment in 2011, addressing the other issues required by the Riverkeeper case and the U.S. Supreme Court ruling on cost-benefit testing. PPRP submitted comments on the proposed rule. The EPA finalized the standards in 2014. Facilities are required to choose one of seven options to reduce fish impingement. Facilities that withdraw at least 125 million gallons per day (mgd) must conduct studies to help their permitting authority determine whether and what site-specific controls, if any, would be required to reduce entrainment of aquatic organisms. New units added to an existing facility are required to reduce both impingement and entrainment that achieves one of two alternatives under national entrainment standards. One year of impingement studies and 2 years of entrainment studies (for facilities withdrawing greater than 125 mgd) must be conducted within the last 10 years. Some facilities already conducted some or all of these studies while others need to conduct additional studies. All facilities subject to the new rule will need to conduct economic and engineering studies to comply with the new rule as their NPDES permits are renewed.